For the last 30 years or so, we have been celebrating the third act of the luminous Tony Bennett’s career. His re-signing with Columba Records in 1986 brought him back to the mainstream, but his early 1990s tributes to Sinatra and Astaire, as well as a generation transcending performance in MTV Unplugged made him everybody’s favorite hip classic crooner. Few pop singers have their first number one album when they are 85, but Bennett has expanded our understanding of hip. A singer of similar vintage who has never quire registered as hip is the enduring crooner Johnny Mathis. Mathis signed with Columbia only five years after Bennett in 1956, and like Bennett, he eventually came under the tutelage of producer Mitch Miller. Whereas Bennett rebelled against Miller’s questionable tastes and hungered for jazz credibility, Mathis and his manager trusted Miller’s commercial instincts and he quickly transitioned from a fledgling pop-jazz singer (his debut album is tentative) to a skillful pop crooner whose appeal transcended age and generation. Despite the common rock-ist narrative that Elvis, Chuck, Buddy, and Little Richard knocked all the crooners off the charts, Mathis was popular on the radio and the album charts. He currently stands among the top five most popular albums sellers of all-time. Mathis was one of the first black singers to have a chart-topping album in the mid-1950s, he was the first artists to ever release a Greatest Hits album, and his name is virtually synonymous with Christmas. Unlike Bennett, he has rarely had jazz pretentions and is quite comfortable being pop and not being hip. For 62 years (!) he has soldiered forth, stolidly applying his delectable tenor to a staggeringly broad range of popular, and occasionally semi-popular, songs. He has sung torch songs, ballads, disco tunes, Brazilian pop, soft soul, folk-rock, gospel hymns, holiday material, showtunes, Jewish sacred music, country, soft rock, movie themes, and pretty much everything else. He has sung solo, in duets, and with choirs. He has sang in English, Hebrew, Portuguese, and Spanish. This versatility is not part of a specific aesthetic strategy other than the old-fashioned notion, among his generation, that a popular singer is an entertainer who builds’ an audience by interpreting the songs of the day in their own vocal style. I listened to all 68 albums featured in the 2017 Johnny Mathis boxed set The Voice of Romance: The Columbia Original Album Collection (Sony/Legacy). · 1957-63: Signature sound: These are the albums where he established his core vocal sound and repertoire. In addition, these albums first cemented his defining songs. At this time established composers such as New York cabaret favorite Bart Howard, and up and comers like Burt Bacharach regularly wrote new material for pop singers like Mathis to premiere. · 1967-77: The “covers” era: Former Columbia Records executive Clive Davis is usually maligned for his baldly commercial strategy of directing Columbia veterans like Mathis and Andy Williams to cover the biggest hits of any given year rather than record new untested material. Though Mathis did not adhere strictly to this, for example Thom Bell and Linda creed wrote new songs for him on 1973’s Coming Home and 1975’s Mathis Is, this is the era of albums mostly titled after number one hits for other singers including like Song Sung Blue, Killing Me Softly with Her Song, You Light Up My Life, etc. Theoretically, these should represent the nadir of his career, but because most are being released on CD for the first time, and because he actually worked with arrangers to tweak them, they may be one of the biggest finds of the set. Toward the mid-to-late 1970s he began sprinkling pre-rock standards in with more contemporary hits, but updating them for the slick pop-soul lushness of the era. · 1978-86: Mathis gets (adult) contemporary era: After having a #1 pop, R&B and adult contemporary hit with “Too Much, Too Little, Too Late,” with Deniece Williams, Mathis began recording more new songs and having hits with original material. His work with Williams was among his most popular material of the decade and he began the 1980s strongly, making appearances on the pop, adult contemporary and R&B charts. · 1986-present: Repertory singer: Having recorded most of the major new pop songs of the '60s and '70s, and scored with contemporary lite FM and quiet storm type material, Mathis recorded mostly songbooks dedicated to composers ranging from Duke Ellington to Alan and Marilyn Bergman to Diane Warren (now that’s a leap! ), as well as sets devoted to Broadway, countrypolitan classics, and of course Christmas music. · 1980’s Rarities: One of the intriguing aspects for a singer as recorded as Mathis is the relative abundance of unreleased material. Several albums, especially from the '70s and '80s, have the occasional bonus cut. Beyond these are three sets of particular interest to Mathis fans. One is 1982’s I Love My Lady a funk-pop recorded with Bernard Edwards and Nile Rogers of Chic but never released. Second is 1983’s Unforgettable: A Musical Tribute to Nat King Cole, a recording from a live BBC performance featuring a medley by Natalie Cole. Third, is 1989’s unreleased Brazilian pop set The Island, produced by Sergio Mendes. Stray tracks have appeared on previous compilations, but this is the full set featuring versions of songs by Ivan Lins, Dori Caymmi, and Mendes, among others. 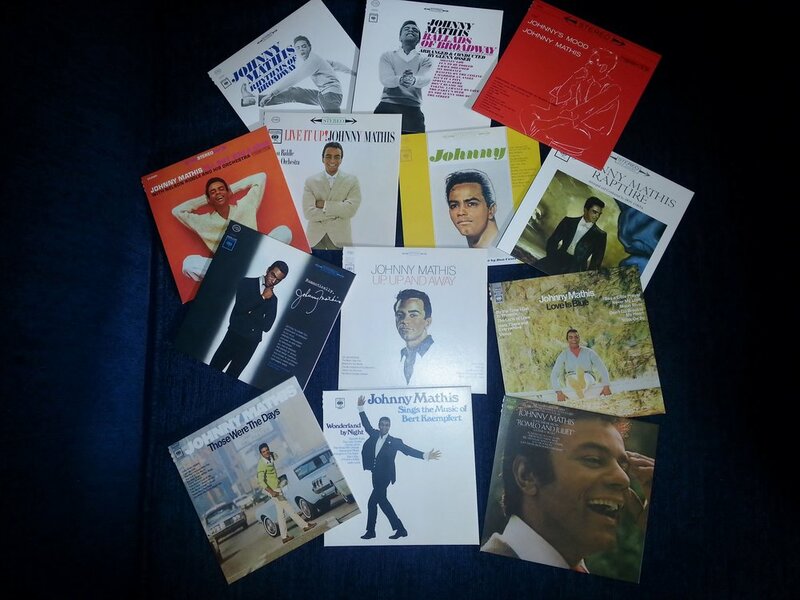 · 1958-2013: ‘Tis the Season: Johnny Mathis does Christmas! Since 1958, Mathis has recorded six holiday albums including five at Columbia and one for Mercury Records. He is probably the signer most associated with Christmas, alongside Perry Como and Bing Crosby. He has recorded a holiday album in nearly every decade since the 1950s warranting special critical attention. Below in Part 1 I trace Mathis’s discography chronologically, from 1956 through his including his 1963-67 Mercury Records tenure. Part 2 explores his career from the 1967 covers era through the 1980's. Part 3 addresses his career from the late 1980's-present when he focused more interpreting music thematically. I also explore the three unreleased albums featured in the box set, and his signature affinity for Christmas albums. The (#) refers to the numbering of CD’s featured in The Voice of Romance boxed set. Albums highlighted are albums I recommend as essential Mathis recordings. Johnny Mathis established his distinctive sound from 1956-59 during his first few years recording for Columbia Records. Mathis established himself as one of the premier new voices of the 1950s by carving out unmined territory that sandwiched him between generations. His crooning style, which blended crooning with his classical training and technique, drew on the ballad repertoire of his idols, such as Nat King Cole and Ella Fitzgerald, was framed successfully by arrangers such as Ray Conniff, Percy Faith, and others whose lush, romantic approach resonated with his generation in parallel to rock and roll and other emerging forms. #1: Johnny Mathis (1956) was an attempt to present Mathis as a jazz-oriented singer, but it is really a pop album, which for the 1950s meant pop standards with minimum vocal improvisation, featuring jazz musicians. Nothing here really distinguished Mathis. By 1957, when he released **#2:Wonderful Wonderful, (1957) arranged by Percy Faith, Mathis as we know him was emerging. Wonderful is a luscious and highly listenable album of ballads with a few uptempo songs for balance. The lush approach is predictably lush and sentimental; an approach that complements his voice and sensibility perfectly. #3:Warm (1957) continues the Mathis sound; it too is lush, orchestral balladry. There is probably a bit more reverb and echo than is necessary but it makes for very moody, enveloping listen. Besides, this was a production style of the ‘50’s. Mathis’s rendition of “Irving Berlin’s “What’ll I Do” was selected for The Smithsonian’s seminal 1984 five disc American Popular Song collection as an exemplary interpretation of the standard. Aside from Christmas music (see Part 3!) Mathis is not generally associated with sacred music. But he, arranger Percy Faith and Columbia apparently thought his voice was well-suited to classic religious songs from multiple faith traditions on **#4 Good Night, Dear Lord and…they were right. Though people associate Mathis with a high, refined tenor sound he sings in a slightly lower range and he sounds gorgeous and in control. On selections like “Swing Low, Sweet Chariot” for example, he does not cover other singers’ approaches. He instead sings in a key and tempo well suited to his distinctive voice and interpretive approach. “Where Will I Go,” is among the standouts, and two refreshingly varied versions of “Ave Maria” round out the set. A genuinely unexpected and moving performance. **#5: Swing Softly (1958) is my favorite Mathis album. Though Mathis prefers to sing melodies as written, and does little improvising, he has a great feel for light swing and mid-tempo material and gives one of his most energetic and endearing performances here. Highlights include wonderful versions of “Like Someone in Love,” “You’d Be So Nice to Come Home To,” and “Love Walked In.” After recording albums with orchestras and big bands Mathis approached things more intimately on **#7: Open Fire Two Guitars (1959) featuring just his voice supported by two guitars and bass. He is at his most sensuous on Cole Porter’s “In the Still of the Night” and at his romantic best on “You’ll Never Know.” A surprising approach in his vast catalog. Mathis’s legendary performance of Errol Garner’s “Misty” is featured on **#8: Heavenly (1959). Surrounding this classic performance are warm, relaxed renditions of gorgeous ballads such as “That’s All” and “More Than You Know.” In the span of three years, Mathis went from a new voice pitched awkwardly between vocal jazz and pop to a distinct new sound of late 1950’s pop. 1959’s Faithfully (#9) and 1960’s Johnny’s Mood (#12) reiterated the style of moody ballads bathed in strings and echo. Slightly more interesting conceptually, was 1960’s #10: Ballads of Broadway, packaged with #11: Rhythms of Broadway, which were sold separately and as a combined “deluxe edition” album. Broadway had always informed Mathis’s repertoire. He was especially fond of songs from Westside Story, for example. But, these two sets brought together some of pop music’s most distinguished songs drawn from the theatrical stage. Mathis is at his best on ballads, such as “Isn’t it a Pity.” He sounds less sure of himself on some of the more uptempo songs where he vacillates between awkwardness, strangeness, and bombast. Mathis’s pairings with the renowned arranger for Nat King Cole, Ella Fitzgerald, Judy Garland, and Frank Sinatra, Nelson Riddle, on 1961’s I’ll Buy You a Star (#13) (1961) and Live It Up (#14) are also uneven. His ethereal tenor seems designed for dreamy songs such as “Magic Garden,” but is a mismatch for the lustier “When My Sugar Walks Down the Street.” A year later, however, he and arranger Don Costa recorded a Mathis masterpiece with sensuous and appropriately titled **Rapture (#15) (1962). The Costa connection persists well on 1963’s Johnny (#16), and **Romantically (#17) (1963). In the 1960's Mathis recorded a broad range of themes with a variety of arrangers. From 1963-67, Mathis left Columbia for Mercury Records. He recorded 10 albums including sets dedicated to Broadway, Christmas, Latin American music, and established and contemporary standards, such as The Beatles’ “Michelle” and “Yesterday.” He also continued with contemporary fare ranging from new showtunes such as “The Impossible Dream,” (from The Man from La Mancha) to bossa nova songs such as “So Nice,” and recent movie themes, including “More,” and “Somewhere My Love.” Sonny/Legacy compiled all of these recordings on 2014’s The Complete Global Albums Collection. In 2012, the record label Real Gone Music reissued several Mercury era Mathis albums in their entirety. These sets include 1964’s **The Wonderful World of Make Believe and Tender is the Night, 1965’s Love is Everything (featuring an unreleased album Broadway), 1965’s This is Love and Olé, 1965’s Sweetheart Tree and The Shadow of Your Smile and 1966’s So Nice and Johnny Mathis Sings. Hopefully, these will shed additional light on Mathis’s prolific career and inspire more critical assessments of his work. **Love is Everything is an appealingly lush and romantic set. He lives up to the title of Everything giving his all emotionally and vocally. He belts out the opener “Never Let Me Go” with tenacious vigor; “Young and Foolish” has an intense, meditative quality as does “This is All I Ask.” Pop songs were usually about three minutes in 1965 but at 3:40 (“Young”) and 4:04 (“This”) the arrangements provide room for him to stretch out. Broadway finds Mathis in his element, show tunes, but it has a very eclectic feel atypical of Mathis’s albums. He delivers some of his funkiest phrasing on a horn-laden version of “Ain’t It De Truth” (a Lena Horne number from Jamaica). “Manhattan” has a charmingly naïve romanticism via his vocal coloration choices. He chews through “Don’t Rain on my Parade” enthusiastically and delivers on fresh tunes like Leslie Bricusse and Anthony Newley’s “Once in a Lifetime.” It is puzzling why this album was not released. **Wonderful World focuses on the dreamy ballads like “Beyond the Sea” and “When You Wish upon the Star”; Tender features more familiar ‘50s and ‘60s fare like “Call Me Irresponsible” and “Somewhere.” As a whole, these recordings refute the sometimes-hysterical assertions that the mid-50s rise of rock ‘n’ roll “killed” romantic American pop. Most the songs featured on these albums are proof that many excellent songs of high melodic, harmonic and lyric qualities emerged throughout the 1960s; and Mathis recorded many of the most credible and enjoyable renditions. 1997’s double-disc compilation Global Masters was the only place to go until Collector’s Choice’s 2009 reissues. In 1969, Columbia allowed Mathis to repackage some of his best Mercury recordings on the compilations **The Impossible Dream and People. Dream is one of the finest crooner “cover” albums of ‘60s pop. Granted, “Strangers in the Night” and “Eleanor Rigby” are not exactly “Roll Over Beethoven”—which is to say not a great stretch for an experienced balladeer. However, this suite coheres amazingly well. Mathis’s performances are rich, impassioned and confident and the material is a strong match. 1960s era movie themes (“I Will Wait for You,” “Strangers,” “Somewhere My Love,” “Moment to Moment”) and showtunes ( “On a Clear Day,” the title track) balance tradition and modernity in their musical and lyrical style in a manner perfectly suitable to a singer who followed the decline of traditional pop and preceded the rise of rock ‘n’ roll. His covers of “Rigby,” “Go Away Little Girl,” and the standard “The Very Thought of You” are also satisfying. People feels more forced and less coherent. He transforms Bobby Hebb’s “Sunny” into an impressively emotional orchestral epic, gently soars on “Quiet Nights of Quiet Stars” (sang in Portuguese), and gives a sprightly performance of “A Wonderful Day Like Today.” However, his robust voice and overripe arrangements almost overwhelm seemingly appropriate material like “The Shadow of Your Smile” and “People.” Other performances such as “What the World Needs Now” are routine retreads. Listeners interested in Mathis's four-year stint at Mercury Records can purchase or download The Complete Global Albums Collection. Albums #18-#22, recorded from 1967-69 find Mathis wavering between the tried and true and newer fare. Whereas some crooners departed major labels altogether but the end of the 1960's Mathis transitioned into a successful career in soft rock. 1967’s **#18 Up, Up and Away is a delightful collection rife with delicate textures, subtle choral backing, and naturalist vocal performances of mellow pop. Among its highlights are a laid-back rendition of the title track, the languorous “Drifting” and the surprisingly agreeable country and folk-flavored songs “Misty Roses” and “Far Above Cayuga’s Waters.” He also turns in fine renditions of the standard “The More I See You” and the Dr. Doolittle theme “When I Look in Your Eyes.” Though hardly a monumental recording, it is a tasteful and accomplished set of modern crooner pop. 1968’s Love is Blue (#19) is a similar suite of light pop. He sings four Bacharach-David songs well, gently croons on Lennon-McCartney’s “Here, There, and Everywhere” and delivers a fine “Moon River.” The rest is lighthearted; the only misstep is an awkward cover of Frankie Avalon’s “Venus” which feels out of place. Mathis concluded the 1960's with 1968’sThose Were the Days (#20), 1968’s Johnny Mathis Sings the Music of Bert Kaempfert (#21), and 1969’s Love Theme from ‘Romeo and Juliet’ (#22). Days rises and falls based purely on the material. The hokey title song, the umpteenth cover of the silly pseudo-homily “Little Green Apples” and a reprise of Skeeter Davis’s “End of the World” seem like wastes of Mathis’s vocal resources. Jim Morrison, Paul Simon, and Rod McKuen are not compatible composers for Mathis’s sensibilities even if he turns in technically competent renderings of their material. Kaempfert is best known for MOR classics such as “Spanish Eyes,” “”L-O-V-E,” and “Strangers in the Night.” Mathis performs these, and other Kaempfert tunes, competently, but it is a pretty stock easy listening pop and does not make the case for the composer as a first-tier songwriter. Love Theme is far more satisfying. Some of the more notable torch ballads from the era featured include fine versions of the Bergmans’ “The Windmills of Your Mind,” Charles Aznavour’s “Yesterday When I Was Young,” and Jimmy Webb’s “Didn’t We.” He is also quite appealing on “Live for Life” and his hit rendition of Bacharach and David’s “I’ll Never Fall in Love Again.” Whereas his renditions of film and musical theater tunes are generally reliable, the title track is epically schmaltzy and his version of the Fifth Dimension’s medley from Hair, “Aquarius/Let the Sunshine In” feels forced. The remainder is agreeable pop material. Part 2 examines Mathis's recordings from 1970-85!